fabrics and notions provided by Minerva Crafts – my long time sponsor and sponsor of this challenge. My night cocktail dress was made with fabric from my stash using Ellie and Mac’s Women’s Bell Sleeve dress pattern. The fabric I chose has a huge print and is soft. I’ll show you shortly. 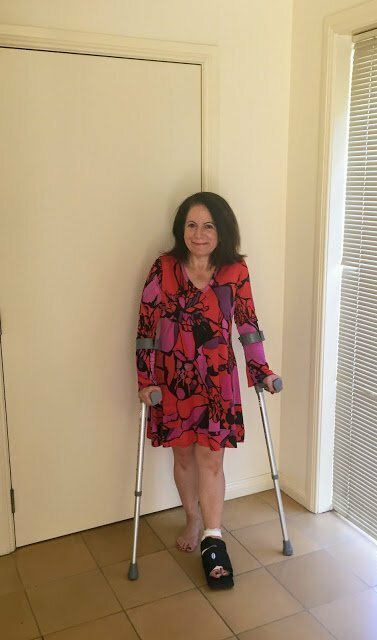 As you can see, I’m on crutches as I had surgery on my left toe a few weeks ago so under doctors orders I have at home with my feet elevated. Standing is painful. The skirt width on this dress is much wider that I would normally wear but under the circumstances, this style makes me feel less restricted. 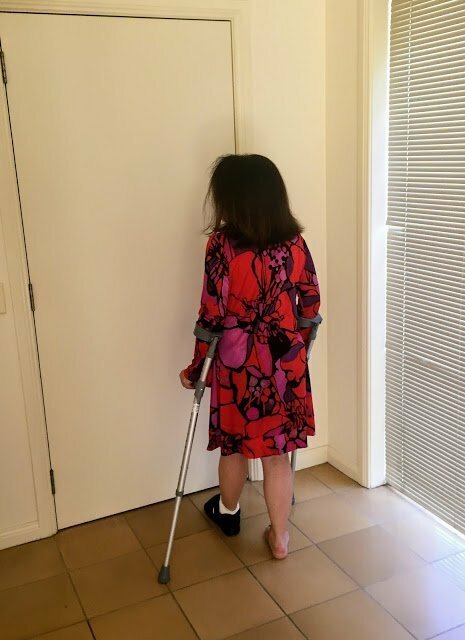 I can’t walk anyway so I can gracefully peer across the house on ‘The Lounge’. I’ve never used Ellie and Mac patterns. 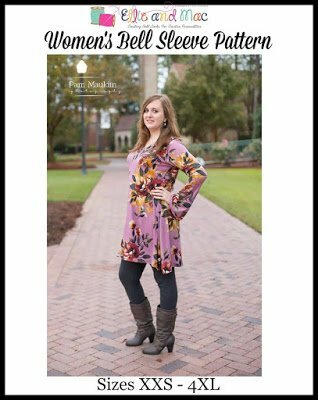 They are one of the challenge sponsors so I got this pattern for free. Ellie and Mac patterns offer a range of children’s patterns and a women’s range. Their patterns are ‘relaxed styling’ and while I’m normally an active person, relaxing styling is what I need during these weeks of recovery. 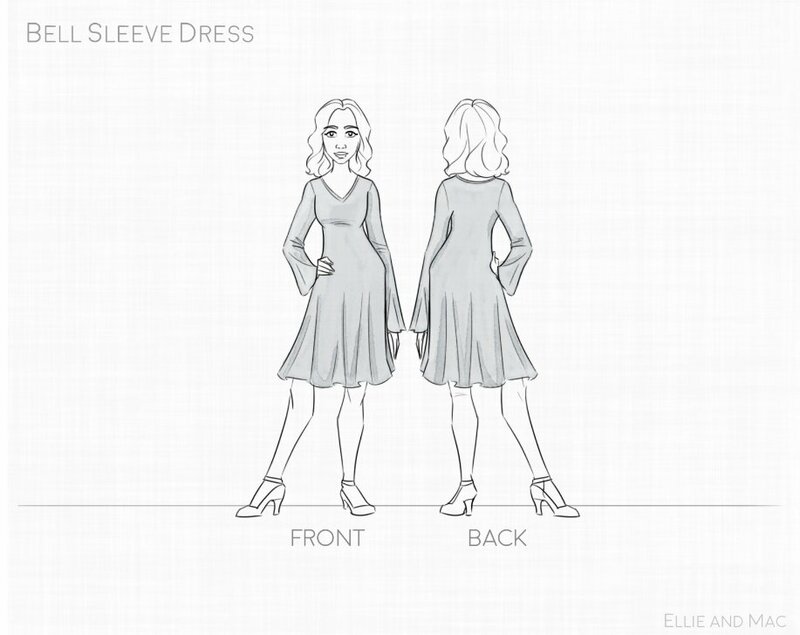 What I love about the pattern is its v-neckline and the instructions for sewing this v-neckline. 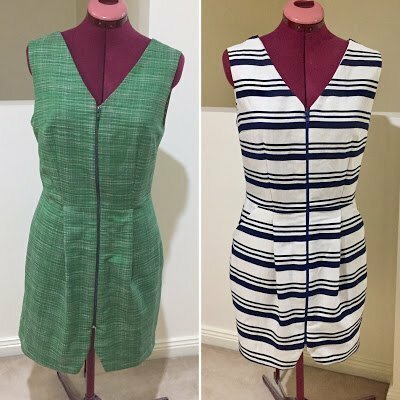 This is also easy to sew using an overlocker, which I did. Maybe it’s how I printed the pattern but there were very few marking on the pattern I printed out so I felt like I was ‘flying blind’. 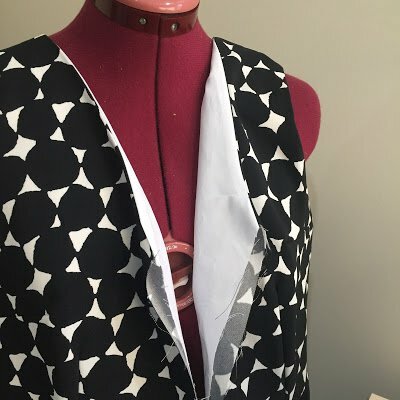 I rely on pattern markings when I sew any project together so I know I haven’t stretched the fabric too far. 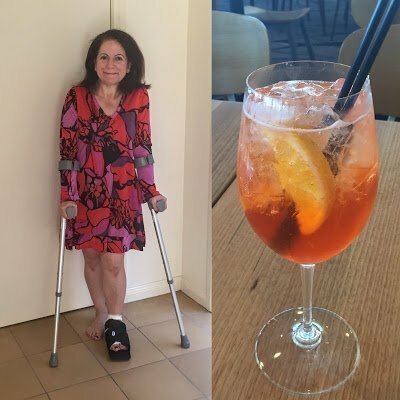 If I wasn’t on pain medication my cocktail of choice would have been an Aperol spritz. Right now it’s soda water and lime but Aperol matches the colour of my fabric. When I made up my Day dress for coffee, I had added pockets to an earlier version and adjusted the pattern to fit me to a tee. We’re coming to the end of Summer here in Australia so this style is great for our weather. I’ve also fully lined this dress with a smooth cotton fabric. These are the two earlier version that use the facings but I felt a full lining would wear better, and it is a better solution for me. 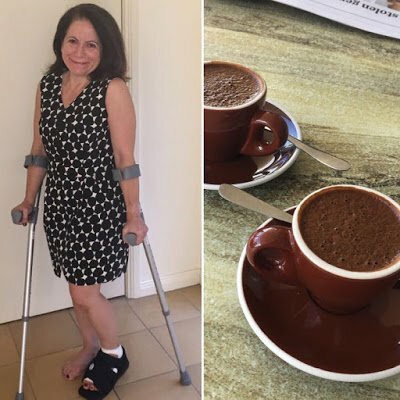 For the purposes of this challenge I had to pair my day coffee dress with my coffee of choice – a Greek coffee. Thanks again to Elizabeth for running this creative challenge. You did a marvelous job Maria as always. I always love seeing your makes in my blog feed. Love the fit you achieved and the fabrics you choose. Lovely dresses Maria! 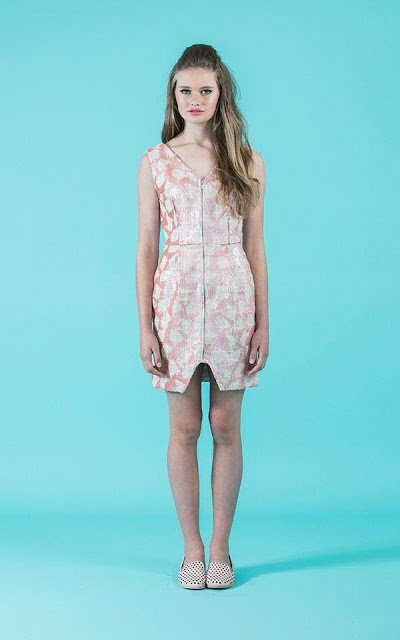 great designs and fabrics! I hope you recover soon! First of all, a big KUDOS to you for having completed your dresses and modeled them with the minimal use of your foot. I love your dresses, they look very comfortable, yet feminine! Your fabrics are beautiful! 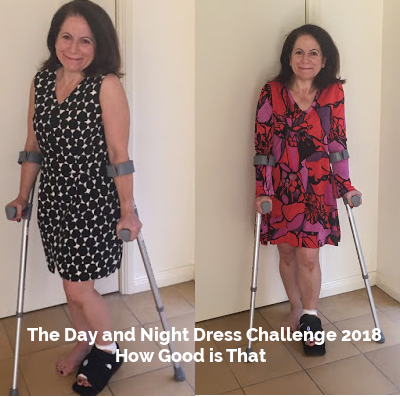 You look great in both dress! Wishing you a speedy recovery!